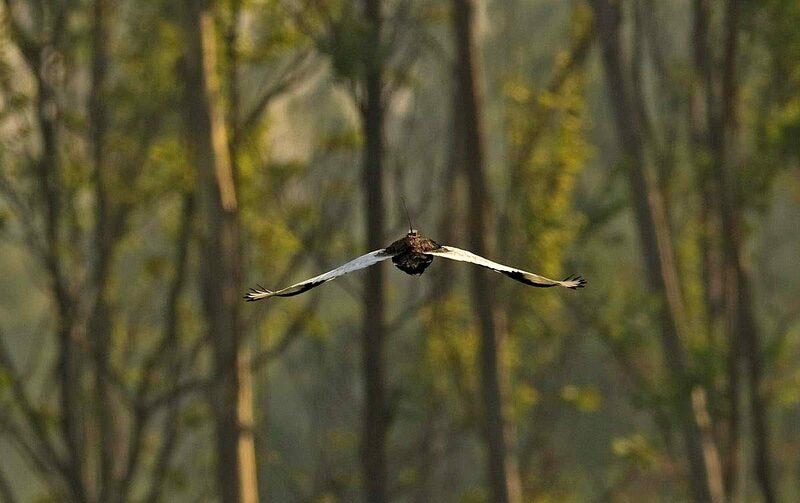 A Bengal florican flies off after being tagged and released in Pilibhit National Park, Uttar Pradesh, northern India. Tracking tags, like the one on this bird, should weigh less than 4 percent of a bird’s body weight. Image courtesy of Dhritiman Mukherjee, BNHS. Until recently, the habits and habitats of the Bengal florican remained a mystery: males were easily seen in their seasonally flooded grassland habitat during the breeding season but effectively disappeared for half the year. Researchers in India and Nepal combined field surveys, satellite telemetry and remote sensing to model the distribution and assess the critically endangered bird’s movements, survival and home ranges. 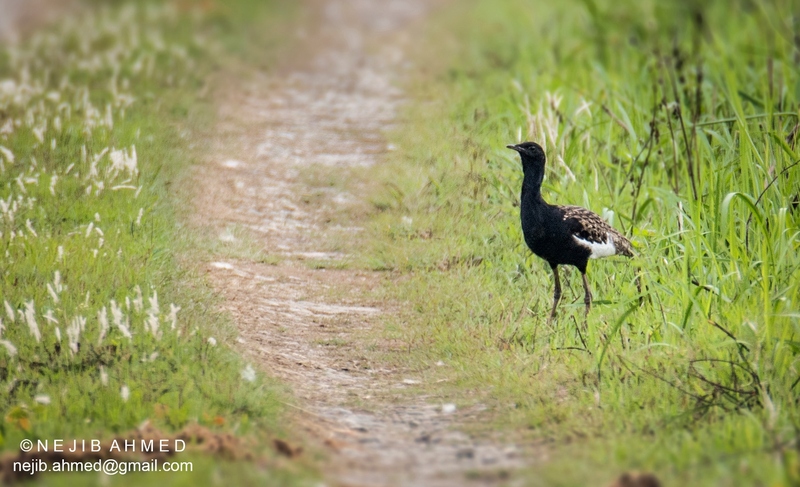 After years of not knowing the birds’ non-breeding whereabouts, the study found that Bengal floricans leave their protected, seasonally flooded breeding areas in favour of unprotected low-intensity agricultural fields and other upland grasslands during their non-breeding season. As dawn peeks through the morning mist on an early spring day in Nepal’s Koshi Tappu Wildlife Reserve, a duck-sized bird flaps its wings and throws itself into the air as if it were jumping on a trampoline. The critically endangered Bengal florican, known for the signature display of its males during the breeding season, can be spotted inside protected grasslands in Nepal and India from early spring until the monsoon sets in around June or July. After that, they vanish. 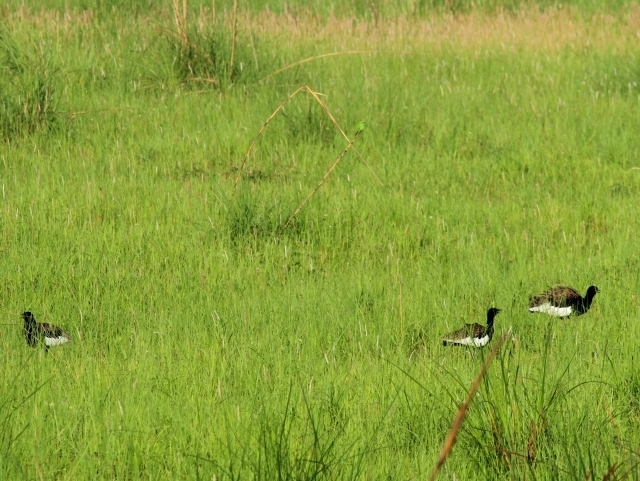 A male Bengal florican appears out of the grass in Assam, India. These critically endangered birds prefer short grasses in areas with few people. Image by Nejib Ahmed via Wikiedia Commons, CC BY-SA 4.0. The Bengal florican, a type of bustard, is a mysterious species in several ways. It occurs in two separate regions: one subspecies (H.b. blandini) lives in Cambodia’s seasonally flooded Tonle Sap region, and the other (H.b. bengalensis) lives in the alluvial grasslands of southern Nepal and northern India, called the Terai. Individuals of the more extensively studied Cambodian subspecies leave their flooded breeding habitat during the non-breeding season for grassy and lightly wooded areas. But the grasslands of the Terai don’t flood for long periods during the monsoon. So why do the South Asian Bengal floricans leave the protected areas when it starts to rain? The global Bengal florican population now stands at fewer than 1,000 individuals, and its elusive movements have hindered conservation managers’ understanding of its distribution and ability to develop appropriate conservation solutions. A group of scientists from India and Nepal, with support from the U.K.-government-funded Darwin Initiative, began studying the florican’s movements in 2012. Bengal florican being fitted with a tracking tag in India’s Pilibhit National Park. These birds make relatively short, seasonal movements between floodplain and upland grasslands. Image courtesy of Dhritiman Mukherjee, BNHS. “We used a combination of field surveys, satellite telemetry and remote sensing to model the distribution and assess the movements, survival and home ranges,” said Rohit Jha, the study’s lead author. Jha and his colleagues captured 11 floricans, from four protected areas in Nepal and one in India, to fit the birds with Argos Doppler tags. These tags send periodic location signals to polar-orbiting satellites. They also conducted field surveys in both countries and used the results to develop distribution models to identify possible new populations. Surveying swaths of tall grasslands where Bengal tigers roam was risky. “For that, we had to climb trees or get on watchtowers,” Jha said. Master trapper Ali Hussain setting a low-tech noose trap to help researchers capture Bengal floricans for tagging in Pilibhit National Park, India. Image by Rohit Jha. But crouching tigers and hidden rhinos were not their main obstacles in tracking the floricans. “The main challenge we faced was in capturing the birds,” Pradhan said. The researchers consulted Ali Hussain, a legendary Indian bird trapper. “Ali Hussain was successful in capturing the birds in a short time using his indigenous traps, and we could [then] tag the birds,” Jha said. Argos satellites collect data transmitted by each tag and measure the frequency of the signals they receive. The satellites relay the data and signal frequency, which changes as the satellite approaches or moves away from a tag, to processing centres. There, computers calculate the tagged birds’ locations by measuring the Doppler shifts — the change in the receiving frequency — of the signals, which is accurate to within 150 meters (492 feet). “The location estimates from tags are less accurate than those made by GPS units,” Jha said, “but the tags are lighter than GPS units,” enabling birds to carry them without hindering flight. The tags, powered by solar panels, carried three sensors: one each to record temperature, battery voltage, and movement. “Fortunately, Bengal floricans are relatively heavy — the average weight of birds caught was 1.4 kilograms [3.1 pounds],” Jha said. “A rule of thumb says that the tag should weigh less than 4 percent of the body weight. Our tags were 30 grams [roughly 1 ounce] — well below the 4 percent,” he added. The researchers, who sighted the birds repeatedly, found that even with the tags the birds moved and foraged freely. “We also made optimum use of the battery so that we could keep receiving data from the tagged birds for a long period of time, as the area we worked in receives adequate sunlight throughout the year,” Jha said. The researchers programmed the tags to remain active for 10 hours and then switch off for 24 hours. “The approach helped us conserve the batteries and provide enough time for recharging the solar panel,” Jha said. Some of the tags are still running into their fifth year. 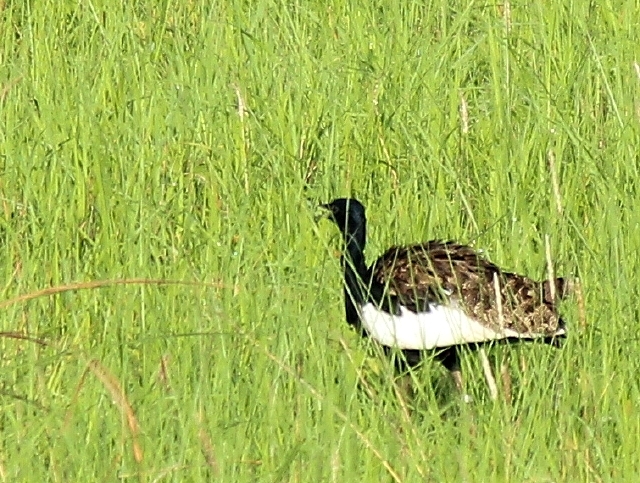 A tagged Bengal florican (note the tag’s antenna above its back) foraging in Pilibhit National Park, India. Image by Rohit Jha. The species distribution models suggested that while the floricans’ distribution is fragmented in the western Terai, sizeable undiscovered populations might exist in eastern parts of the species’ range, particularly along the Brahmaputra River. The models also suggested that some areas become unsuitable after breeding season, which may force the birds to leave protected areas. Why do Bengal floricans leave protected areas after breeding? 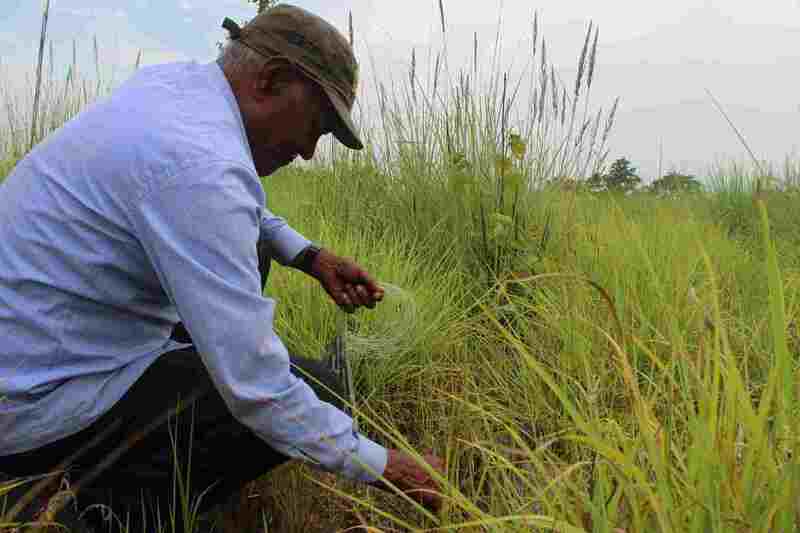 Ornithologist Hem Sagar Baral, who has followed the research, said Bengal floricans thrive on “semi-natural” grasslands, created and maintained by various factors. 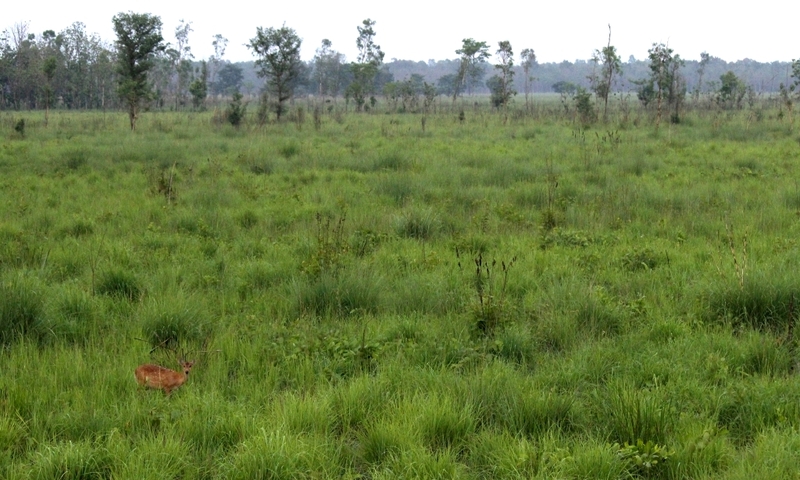 Grassland management at Pilibhit National Park in India includes prescribed burning of grasses in Bengal florican breeding habitat before the birds arrive there early in the year. Image by Rohit Jha. In the past, the grasslands supported large herbivores that grazed on the grass and created suitable habitats for the floricans. “We have seen in protected areas of the subcontinent that the number of large herbivores is not even near the historical numbers,” Baral said. “People used to venture into the grasslands to get fodder for their cattle, and that would also maintain the habitat of the birds,” Baral said. “But such activities are not allowed inside protected areas now.” Bengal floricans find suitably short grassland near the protected areas on riverbanks and in agricultural areas, which puts them at risk. “In certain parts of the region, bustards are considered game birds and are eaten by humans,” Pradhan said. 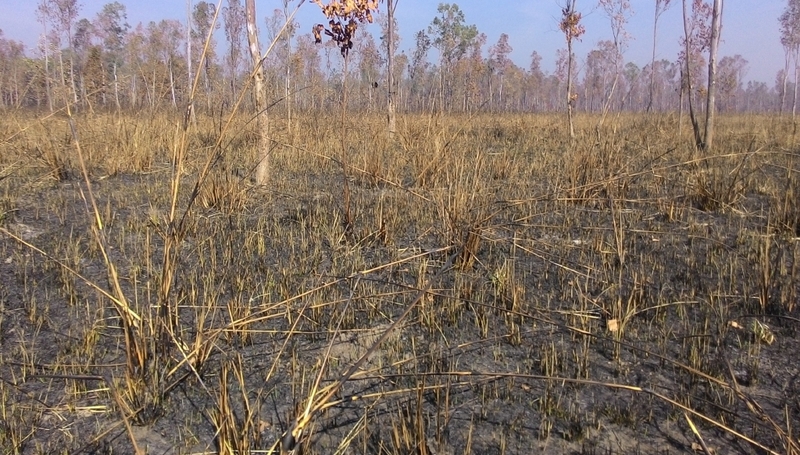 Short grasses with sufficient cover make suitable florican breeding habitat after recovery from burning or clearing. Image by Rohit Jha. Do the birds travel to Cambodia? No. What surprised the researchers was how “site-faithful” the tagged birds were. “We found that the male birds would return to not only the same area, but also near the same spot where they were displaying during previous breeding seasons,” said co-author Jyotendra Jyu Thakuri, who coordinated the study in Nepal. Baral said the study was a somber reminder that only a handful of Bengal floricans remain and that we might lose them soon if action is not taken to conserve them. Three male Bengal floricans compete for females in Pilibhit National Park, Uttar Pradesh, India. Image by Rohit Jha. Jha, R. R., Thakuri, J. J., Rahmani, A. R., Dhakal, M., Khongsai, N., Pradhan, N. M. B., … & Buchanan, G. M. (2018). Distribution, movements, and survival of the critically endangered Bengal Florican Houbaropsis bengalensis in India and Nepal. Journal of Ornithology, 1-16.